Greg Delks, Firehouse Subs V.P., Wayne Hogan, Robin Peters, & Nancy Palmer, Firehouse Subs Public Safety Foundation. I had the privilege of speaking with Bartram Trail High School students about the dangers of distracted driving. 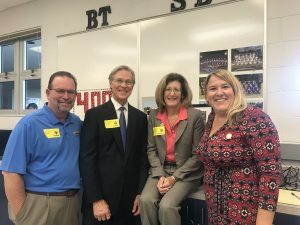 It kicked off a week-long series of safety presentations at area high schools about distracted driving and impaired driving, a joint collaboration between Firehouse Subs Public Safety Foundation and The Casey Feldman Memorial Foundation. 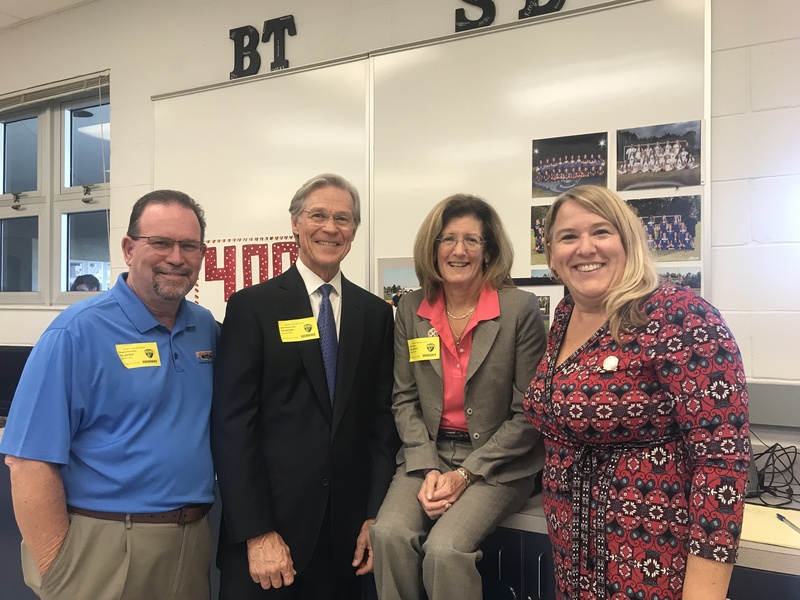 The presentations, which took place at St. Johns County high schools and Jewish Family & Community Services, were organized by Firehouse Subs Public Safety Foundation. Greg Delks, a Firehouse Subs executive, lost his daughter, Morgan, to impaired driving. The Delks created Mermaids for Morgan to honor her memory and prevent future similar tragedies. 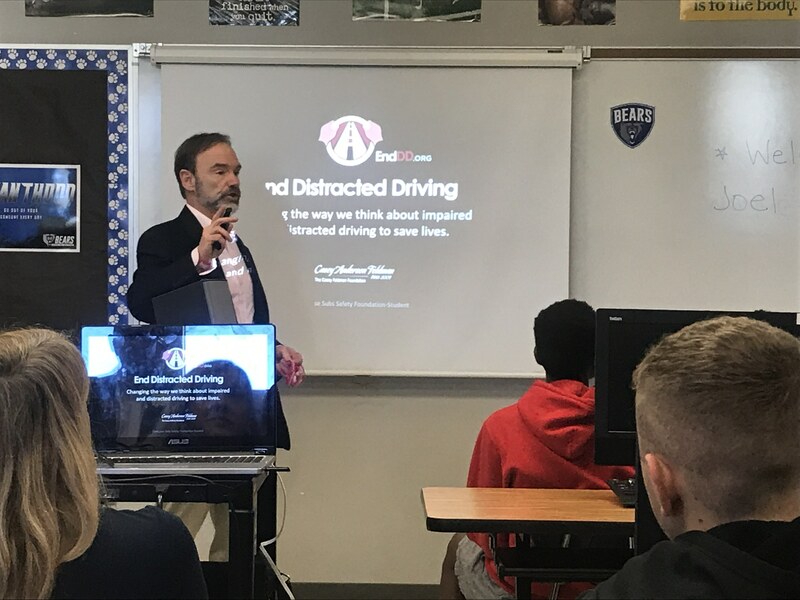 In organizing the presentations, Mr. Delks joined attorney Joel Feldman, creator of the End Distracted Driving initiative, whose daughter, Casey, was killed by a distracted driver. The two fathers teamed up to educate youth about the tragedies caused by distracted driving and impaired driving. Joel asked me to participate in some of the End Distracted Driving presentations. 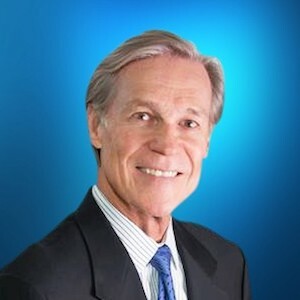 Since 2012, our firm has given the presentation to area high school students, thanks to Joel and his wife, Dianne Anderson, both Philadelphia attorneys, who created the educational program from personal tragedy. 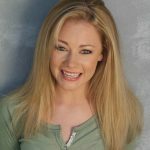 In 2009, their daughter, Casey, was killed by a distracted driver while in a crosswalk on her way to a summer job in Ocean City, New Jersey. She was only 21. Joel and Dianne founded the Casey Feldman Memorial Foundation and from it, the End Distracted Driving initiative to honor her legacy. 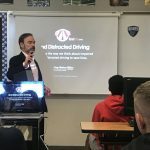 They collaborated with traffic safety experts, psychologists and other experts to create the End Distracted Driving presentation for teen drivers to help save lives. By generously sharing their educational program with volunteer speakers nationwide including trial attorneys, healthcare professionals and law enforcement, more than 400,000 students and drivers in the U.S. and Canada have been reached to date. I am honored to be a part of this life saving effort. The goal of End Distracted Driving is to do just what its name expresses: to help end the distracted driving epidemic, which claims more than 3,000 lives each year. Joel is now developing a curriculum to reach elementary students, before they are old enough to get behind the wheel. Remember, one text or call can wreck it all. If you would like to request a complimentary End Distracted Driving presentation or a For the Workforce presentation, for employers and civic groups, call (904) 722-2228.